This is my favorite version of the classic Greek sauce – tzatziki. Some versions suggest peeling the cucumber. The skins provide more fiber and color, so I do not peel the cucumber. Just make sure to wash the cucumbers well. Cucumbers contain about 95 percent water. 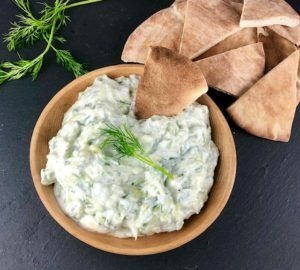 In order for the tzatziki to maintain a creamy consistency and not have the water separate, it’s important to remove as much water as possible from the cucumber. I grate the cucumber and sprinkle with salt in a fine mesh strainer (you could also use a cheese cloth). By grating the cucumber instead of dicing, more moisture is released and the tzatziki is creamier. Adding salt while the grated cucumber is in the strainer helps to release the moisture and enhances the flavor. Several substitutions could be made in this recipe. If using “regular” cucumbers instead of the English hot house cucumbers, before grating, split the cucumber lengthwise and scoop out the seeds with a spoon. Full fat Greek yogurt could be used instead of low fat. I don’t recommend substituting regular yogurt. Instead of lemon juice, white wine vinegar could be used. Although I prefer fresh dill, mint or parsley could be used. For the best flavor, make the tzatziki a few hours prior or the night before serving. At the last minute, stir in the chopped dill. This is great served on top of my Chicken Shawarma. The recipe will be posted soon. Make sure you subscribe to receive email updates. A creamy cold cucumber and yogurt sauce or dip. As a sauce, serve on top of gyros, shawarma, fish or falafels. Also fantastic to serve as dip with warm pita bread and crunchy vegetables. For best flavor, allow to sit for a couple hours or overnight in the refrigerator and stir in the fresh dill at the last minute. Shred the cucumber and place in a fine mesh strainer. Place strainer in the sink or over a larger bowl. Sprinkle salt over cucumber and mix with your hands to combine. Allow the cucumber to sit in the strainer at least 30 minutes. Meanwhile, combine the yogurt, lemon juice and garlic in a medium size bowl. Using your hands, squeeze the cucumber to remove as much moisture as possible. Stir the cucumber into the yogurt mixture. Just before serving, stir in the minced dill. If you substitute regular cucumbers, slice in half lengthwise and scoop out the seeds with a spoon before shredding. Sprinkling the salt over the cucumber in the strainer helps to release the moisture and enhance the flavor of the cucumber. In place of a fine mesh strainer, substitute a cheese cloth to drain the moisture from the cucumber. 2 tablespoons of white vinegar could be substituted for the lemon juice. Parsley or mint could be used in place of the fresh dill.